How does the FarmShare program work? Rather than a set # of items each week (as in many CSA’s), with our FarmShare program you choose the items you want from a list of what is available on our farm each week for your box. You choose the items and the amounts you would like and they are harvested the morning of your scheduled pick-up at the farm. The choices offered each of the 26 weeks are the same harvest that our family is enjoying at our own table that week. You simply pre-pay as little as $100 to start an account balance. When the season begins in early May, you will receive an email notice of what is being harvested that week, the amounts available & the cost of each item. Then giving us a minimum of 24 hours notice, you place an email order of the choices you would like included in your box for that week. We will then harvest your items the morning of your assigned pick-up. The total value of the items in your FarmShare box is then subtracted from your account balance. You choose what items you would like, the amount, and then are charged only for those items. When your account balance gets low we email you to let you know it is time to refill your account. We do ask that you commit to a full season of a FarmShare to help us in planning and implementing our season. The season is normally from early May to the end of October (26 weeks) but each year brings it’s surprises and variables to that schedule. What can I expect in my FarmShare box? The produce offered changes with the season. Everything from Asparagus to Zucchini that we grow on the farm is available, but only during its growing season. 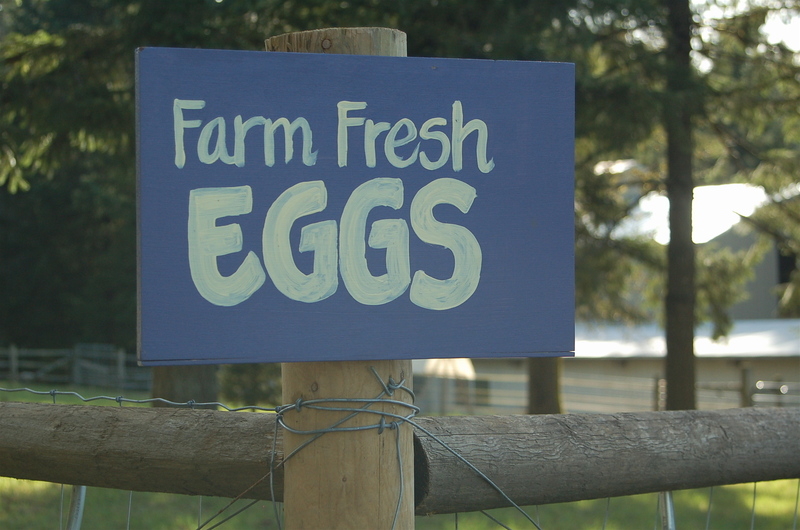 Products in a FarmShare may include, Organically produced eggs, vegetables, fruits, berries & flowers. 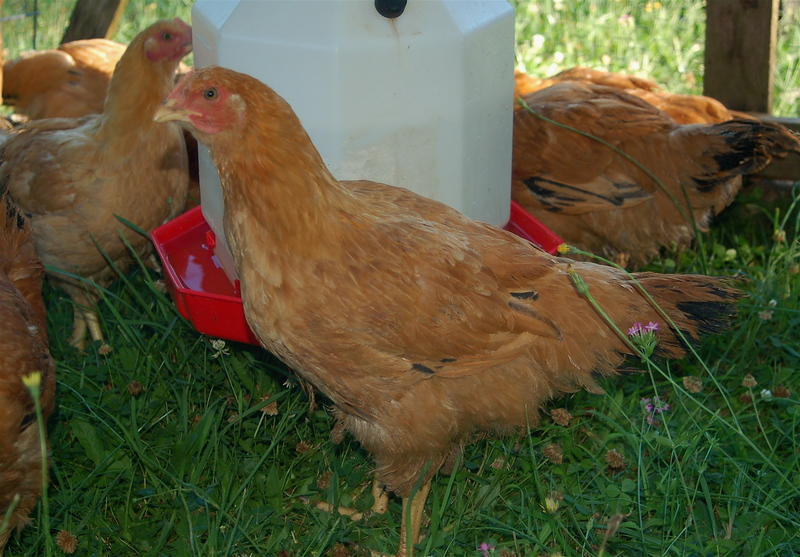 An added benefit to being a FarmShare member is that it also allows you first choice of other products grown on the farm such as chicken fryers, honey, and beef shares as they become available. In a Spring box you might have a choice of, but not limited to- lettuce, spinach, salad greens, strawberries, radishes, green onions, rhubarb, asparagus, snap peas, cabbage, broccoli, daffodils & eggs. In a Summer box you might have a choice of, but not limited to- lavender, raspberries, tomatoes, peppers, sweet corn, summer squash, cucumbers, kale, dahlias, green beans, french filet beans, basil, broccoli, cilantro, carrots, garlic, melons, eggs & fryers. 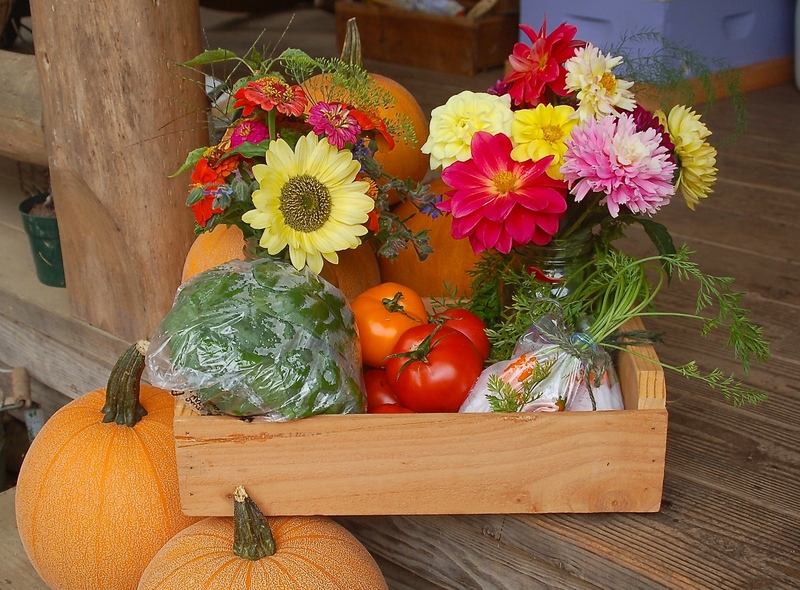 In a Fall box you might have a choice of but not limited to- zinnias, tomatoes, winter squash, potatoes, onions, herbs, cabbage, pumpkins, kale, spinach, lettuce, broccoli, sunflowers, carrots, apples, garlic, dried beans, eggs, honey & fryers. 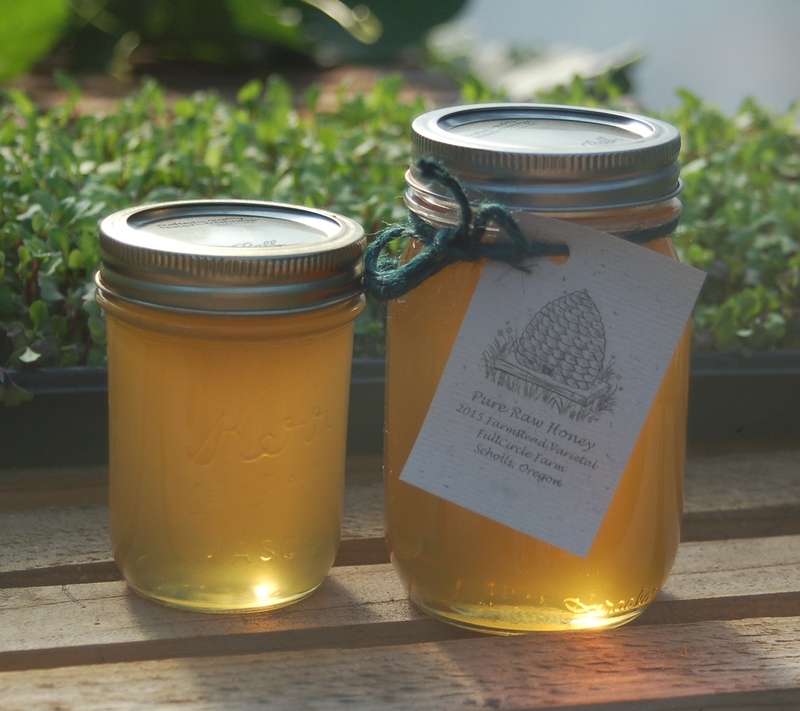 Each week is different, the amounts may vary, sometimes crops fail, the FarmShare simply follows the seasonal ebb and flow of the farm. Shares will usually begin the middle of May and continue thru the end of October. Sometimes product may be available earlier or later than that. We will keep in contact by email so you will always be aware of what is available. How do I sign-up and pay? Email Cathy @ fullcirclefarm.scholls@gmail.com if you have questions about the program or are interested in signing-up for a share. I will then provide you with a FarmShare sign-up form that you read and sign. Return the form to me with your first minimum payment of $100 to start an account. Our 2017 season FarmShare program sign-up begins January 1st. A deposit of $100 is due by Feb 1st to reserve your share for the season. There are a limited number of shares available and they do fill quickly. Contact me if you are interested in joining this unique local food experience. -Thank You for your interest in our farm! 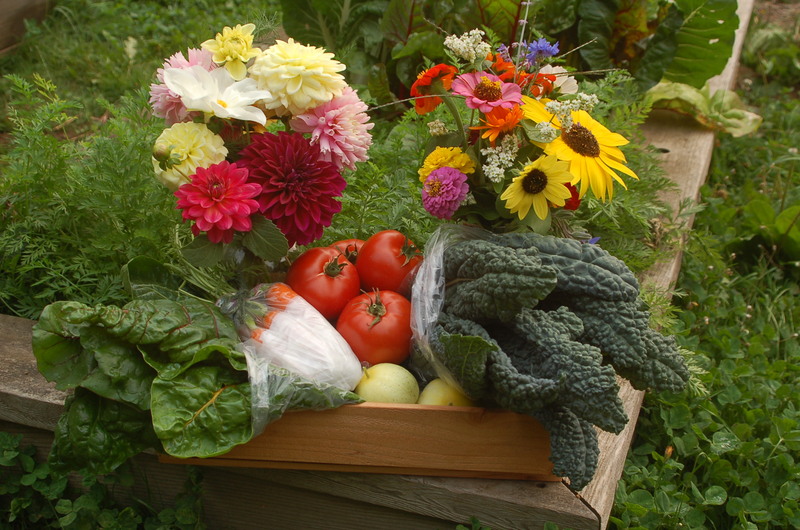 Follow this photo gallery of the seasonal view of some or our 2014 FarmShare Boxes.